From the water wars and the pumping races in California in the 1950s to irrigation systems in Spain and mountain villages in Switzerland, all have demonstrated that people are able to draw up sensible rules for the use of common-pool resources like water. Water in the 21st century will increasingly need its own set of sensible rules to meet the new political, economic and environmental realities of the 21st century. 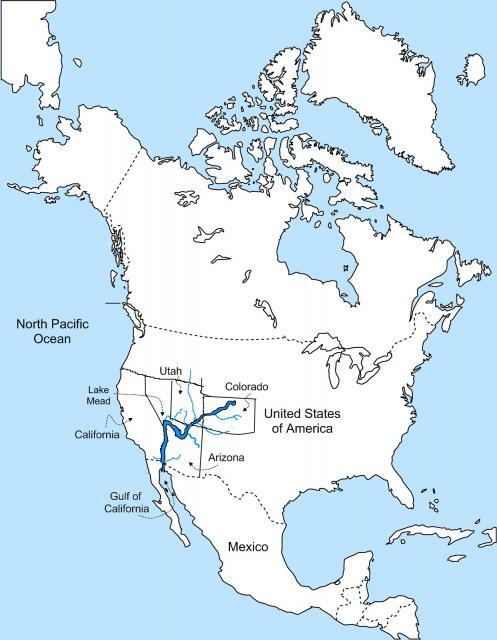 The Colorado River provides much of the water for many cities and farms in seven states in the US including Colorado, Wyoming, Utah, New Mexico, Nevada, Arizona and California before it reaches México. But flows of water on the Colorado River in the US have been forecast to decrease by up to 30pc by 2050. In the Northern States its water supports cattle empires. In the Southern States especially in California, the river irrigates deserts to produce much of the US' agricultural products, fruit and winter vegetables. And all along the way, aqueducts branch off to supply cities from Salt Lake City, Denver, Phoenix and Los Angeles. Interestingly, the Metropolis closest to Lake Mead, Las Vegas, gets 90pc of its water from this one source. Arguments over water tend to have four dimensions – physical, legal, political and cultural. For the physical the standard response is to summon the engineers. In the case of the Colorado River, engineers are already digging a new intake at 890 feet (lower than the current intakes as the water level in Lake Mead has decreased to ensure a guaranteed water supply to Las Vegas). Another response is to call in the lawyers. This was the preferred approach in the 20th century, in the era of the so called “water wars”. Starting with the the Colorado River Compact of 1922 and continuing with statutes, a treaty with México and case law until the 1960s, a truce was achieved. Called the Law of the River, the resulting regime determines who along the river has what right to how much water. At least, it does in theory. The problem is that the law took shape after two decades of record water flows, which became the basis for allocation. As a result it apportions more water than there is in the river. For decades that did not matter, since there was so few people. Then the cattle, fruit and people multiplied. The law's seniority rules theoretically mean that, for example, the taps to Las Vegas would be shut completely before agriculture in California were to loose a drop of water. This gives rise to the political dimension. In the 21st century, cooperation has mostly replaced the old rivalries among agricultural and urban users among the seven river states. 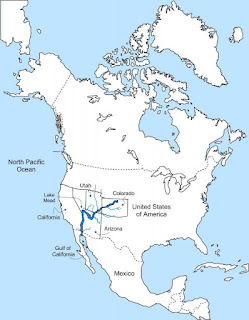 Nevada and Arizona have a water banking partnership and Arizona stores excess water in its aquifers to share with Nevada if needed. In California, the water utility of Los Angeles has bought water rights from some farmers. But inevitably arguments still persist. This leads into the final dimension which is the cultural dimension. The argument here is directly related to the culture of the US West. For example, does every middle-class household really need a lawn in a desert? In some cases, counties have begun paying their citizens to rip out their turf and opt for a desert landscape garden instead that can be just as chic. Most of the water that flows down the lower reaches of the Nile, the world's longest river, comes from the Ethiopian highlands. Up until recently the Ethiopian Government had been content to abide by a Nile River Water Treaty negotiated in 1959. The trouble is the current treaty has strongly favoured the biggest and most influential consumer of Nile water, Egypt. Ethiopia, which has recently overtaken Egypt as Africa's second-most populous nation has joined together with the other upstream Nile nations including Burundi, Congo, Kenya, Rwanda, Tanzania and Uganda to re-write the 1959 Nile River Water treaty taking advantage of the power vaccuum in Egypt's leadership after the Arab Spring. The combined population of the upstream countries along the Nile is 240m against Egypt (85m) and Sudan (30m) and South Sudan (14m). There are also plans afoot for Ethiopia to dam its bit of the Blue Nile and to build a large hydro-power capacity that would be the centrepiece of a plan to increase the country's electricity supply five fold over the next five years. These plans will undoubtedly have a big impact on other Nile countries downstream and have the potential to provoke cross-border water conflicts. In order to extract gas held in the hard shale rock, it is necessary to break up small sections by firing large quantities of water mixed with fine sand and fracking chemicals at a very high pressure to make the shale rock give up its gas. 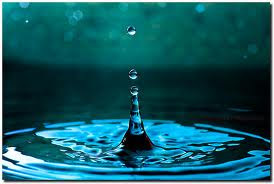 Water has been identified as a serious problem for mining shale gas mainly because of the quantities of it that are needed to successfully frack wells. But worse of all there have already been cases where local ground water aquifiers have been polluted by the harsh chemicals used in the fracking process. It is estimated that the average shale well uses around of 22m litres of water to extract the gas. If as predicted by many energy experts, shale gas extraction goes ahead at full speed, worldwide gas could make up around 25pc of primary energy by 2035 adding further pressure to the common pool resource of water. The Geo-Trade Blog believes there is an increasing awareness of the need to act on the world’s impending water challenge in the 21st Century. Nevertheless growing global resource use highlights the complex interdependencies between water and energy, agriculture, industry, urban growth and ecosystems. Governments and business need to prepare for long term water scarcity and to consider a framework to share the world's water - a common pool resource. Of particular importance are the challenges to addressing water issues at policy level nationally and internationally, to avoid cross-border water conflict. The Geo-Trade Blog believes that people do have the capacity to draw up sensible rules for water use in the 21st Century but consideration needs to start now.